It’s been two years since Atty. Mel Sta. 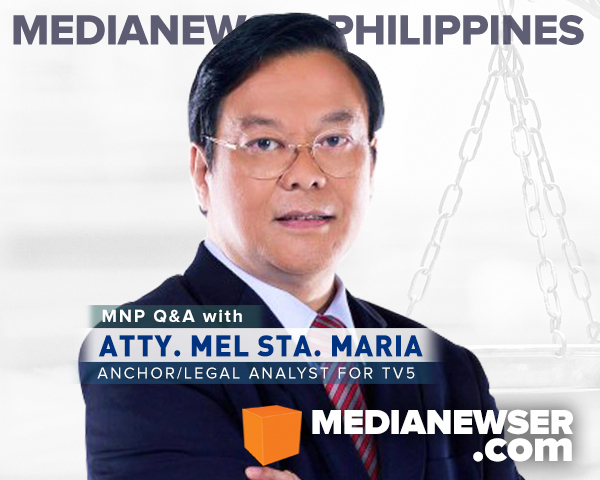 Maria scored that much-talked-about interview with former President Benigno “Noynoy” Aquino — the interview which started a national conversation about constitutional amendment in light of the latter's claims of judicial overreach. The TV special dubbed then as "Interview with the President," as we can all recall, drew widespread praise from viewers and critics. 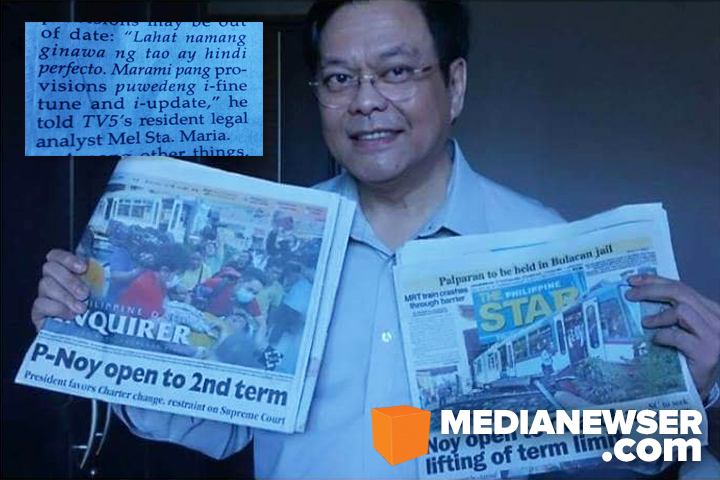 Media Newser Philippines called it a straightforward interview, intelligently conducted by Sta. Maria himself, while also writing in our 2014 yearender, that he "displayed the kind of broadcaster that other TV5ers are longing to be." Constitutionalist Fr. Joaquin Bernas, in the foreword of Sta. 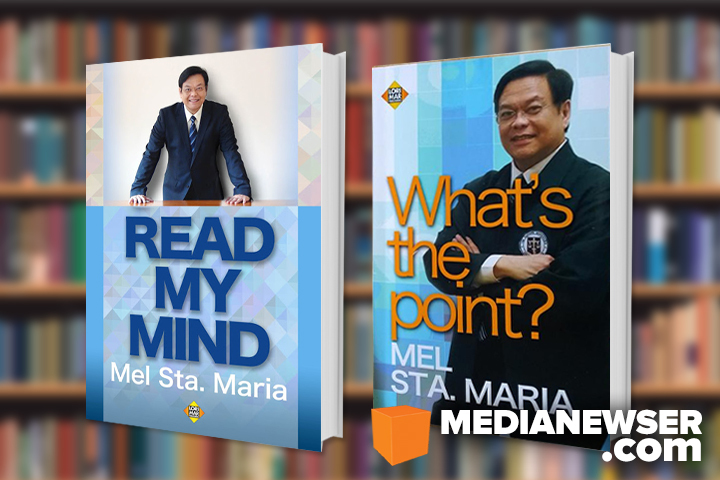 Maria's book, What's The Point, also lauded the interview, writing that "it was a case where the interviewer made as much impact as the interviewee," and that the "newsworthiness of future Philippine presidential interview will be judged by comparing them to the high standard Mel had set." A lot has changed since then. Aquino has been succeeded by the popular mayor of Davao City, Rodrigo “Rody” Duterte; while Sta. 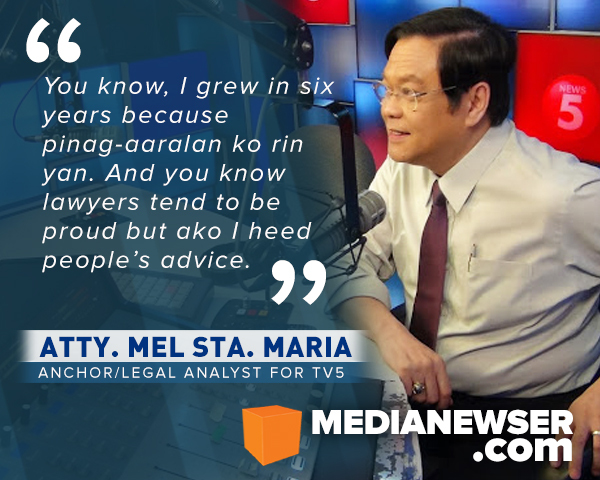 Maria, with the acclaim he received following the interview, became one of TV5’s most valuable news talents. his Relasyon co-host, Luchi Cruz-Valdes, in 2016. He has since then participated in many of the Kapatid Network’s special coverages – the pre-PiliPinas Debate show in March, the 2016 election day broadcast — and headlined some of its programs including Aksyon Sa Umaga, Politics for Beginners, and the short-lived Solved na Solved with Gelli De Belen and Arnell Ignacio. Now 59, Sta. 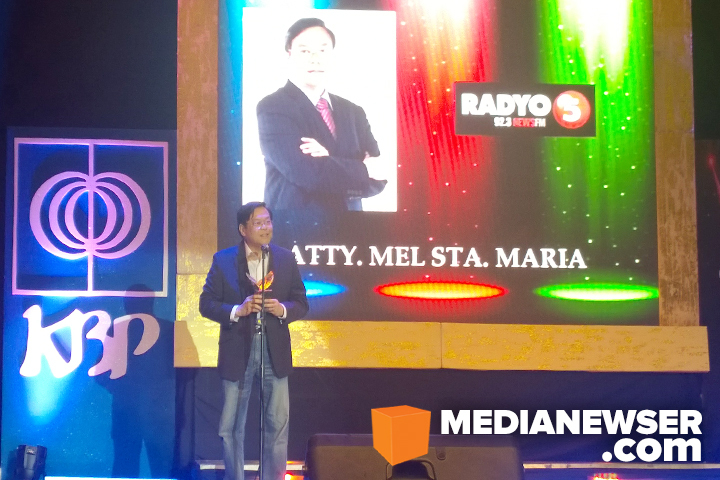 Maria continues to serve as Luchi Cruz-Valdes’ co-anchor on Radio Singko 92.3 News FM’s midday program Relasyon — the same program in which he won the Best Public Service Program Host award during last year’s Golden Dove Awards – and as the dean of Far Eastern University Institute of Law. 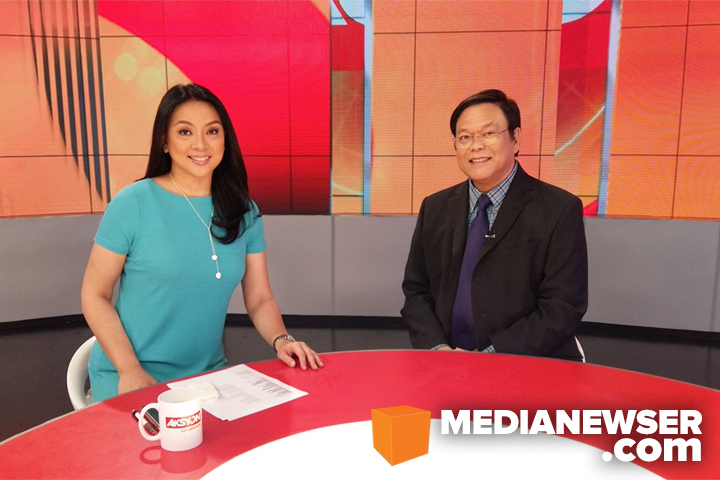 Media Newser Philippines recently caught up with the highly respected lawyer turned broadcaster to talk about his career paths, his game-changing interview with President Aquino, and his hopes for the future. Be sure to join the conversation below or on our Facebook page. You can also tweet us @medianewserphil. Good afternoon, Atty. Mel. Thank you for allowing us to interview you in person. A lot of people know you as a lawyer or as a TV or radio broadcaster. Just to give our readers a sense of who you are on and off camera, sino po si Mel Sta. Maria? Well, I consider myself just a simple guy. You know, a simple guy who tries to earn a living decently to survive, and just to be happy. That’s why you see me for example on Aksyon sa Umaga, “Oh mag-Running Man ka naman, Atty. Mel!” Fine! I don’t mind. Life is just too short for me. My greatest treasures are definitely my my wife and my children. This is what I always say: You can say what you want to say about me, you can criticize me to heaven and to hell, but the only criticism that matters to me is the criticism of my wife, and also my children. Nothing else. So, probably that’s why I can be as stoic as I can be. My only real witnesses are the members of my family. They are the ones who know me. With Cheryl Cosim on the set of Aksyon Sa Umaga, the morning program which he co-anchored from April to July 2016. Tell us about your academic background, atty. How did it shape your life? I took up Biology in college but I ended up studying Law, because back then I was with Ateneo Student Catholic Action. I was then more active in the socially-oriented organization than in our Bio Pre-Med Society. In a way it affected me also. Nakakulong pa si Ninoy Aquino sa Laur, Nueva Ecija, nakaT-shirt na kami na Ninoy noon. Martial Law noon. We were there to change to world, during the Martial Law era. During my college days, we used to fetch political prisoners. Diyaan ako nahubog, ‘yun ang aking orientation kasi. There was a time when my wife and I fetched practically 100 political prisoners. That’s why tuwing nakikita ko itong mga tao ngayon, they just don’t really know what happened. The country has a life of its own now. Ang gusto ko lang there is freedom of information and freedom of speech. Huwag lang mawala mga ‘yan. You can say what you want to say, side with whoever you want to side with, because noon kasi talaga wala niyon. So, that’s the kind of orientation I had. When I eventually graduated with a degree in BS Biology, and it’s a hard course ha, I told my parents, “It’s not for me. What’s for me is Law.” Kaya kung makikita niyo ‘yung 1978 Aegies, I was such an idealistic person, buksan niyo ‘yung sa Biology [majors], hindi ba sa mga pictures ng students andoon ‘yung mga write-up nila? Ang nakasulat lang sa akin isang sentence lang, “The Ateneo has taught me justice, but where is justice?” ‘Yun lang. When I finished Law, I was against government. But I thought to myself, what’s in there? Eh nagtry ako, underbar ito, sa Office of the Government Council. Ako 'yung sa nagpa-file ng kaso. Gusto ko kasi matuto ng litigation. Noong araw kung gusto mo matuto ng litigation, it’s either you go to a small firm or you go to government na talagang lubog ka sa kaso. And when I became a lawyer, I went out. And then natangap ako sa SyCip — that was a big firm. When I went inside and when I was finally accepted, I realized it was not for me. You have to feel it, and I feel that the corporate thing is not for me. I will be servicing a corporation without a face. ‘Yun ang aking parating sinasabi. So, I went to a small law firm. Doon ako nag-pratice. Ang kasabay ko pa diyan si Rey Espinosa [former TV5 president], who was my classmate in Ateneo. Tinawagan pa ako niyan, “Ano ka ba Mel? Andito na tayo sa SyCip.” Sabi ko sa kanya, “Alam mo Rey, it’s not for me. It’s just that I do not feel myself inside that big law firm.” So, yung law firm ko, sa Tanjuatco Law Firm, it was just a small law firm. After six years diyaan sa law firm na ‘yan, I said I’ll do it on my own. So, my stint as a solo practitioner is longer than being connected. Aside from his bestselling law books, Atty. Mel also wrote Read My Mind in 2013, and What's The Point in 2015, both of which contain his commentaries on current events. Eventually you would take on another role as a law professor for Ateneo. Tell us about that experience. I didn’t really have plans to teach at Ateneo pero sabi ng dating professor ko na magturo daw ako. So na-hooked na ako sa pagtuturo, and I love Ateneo! Nagustuhan ko talaga until I came up with that book, Persons and Family Relations Law. That book became, modesty aside, a bestseller. Gumawa pa ako ng isa pang libro, Obligation Contracts, tapos isa pa uli, Court Procedures in Family Law Cases. So, in a way, one of my expertises ay persons and family law, also contract Law and also litigation, until I came into international arbitration. "You can say what you want to say about me, you can criticize me to heaven and to hell, but the only criticism that matters to me is the criticism of my wife, and also my children. Nothing else." International arbitration, what a very timely subject, Atty. Mel. That was during the latter part of my practice, when I was around 49 to 54 years old, naging international arbitration na ako, sa Hong Kong, Singapore, Australia. That was just my life back then. I was teaching, I was writing a book, I was working as a solo practitioner. ‘Yaan ang aking ikot. Eh, noong bata ako hanggang Laoag, Surigao, isang araw lang ‘yan back and forth. Ganoon ako katindi. But when I reached the age of 54, parang sinusuklian na ako, nagpatingin ako sa doctor, umiikot na paningin ko. Sabi sa akin ng doctor ko, “Atty. Mel, you’re not young anymore. You’re damaged goods. Ang taas ng uric acid mo, ang taas ng blood pressure mo, ang taas ng cholesterol mo. You’re not young anymore so just relax. Sabi ko sa sarili ko, it’s over. Practicing for me is over. Going to court every day, drafting contracts, it’s finished. I love law, I love serving and helping people, but in a way when you look at your family and you say, “Eh kung mamatay ako ng maaga?” It’s not worth it. Magtuturo na lang ako. We have saved enough, at hindi naman tayo magpapayaman sabi ko sa asawa ko. Since sa Ateneo naman ako nagtuturo, libre naman mga anak ko, libre sa college. So that’s it, pwede na ito. Tsaka may passive investments naman kami. Relax na tayo. So, my wife and I decided mutually that practicing for me is over. 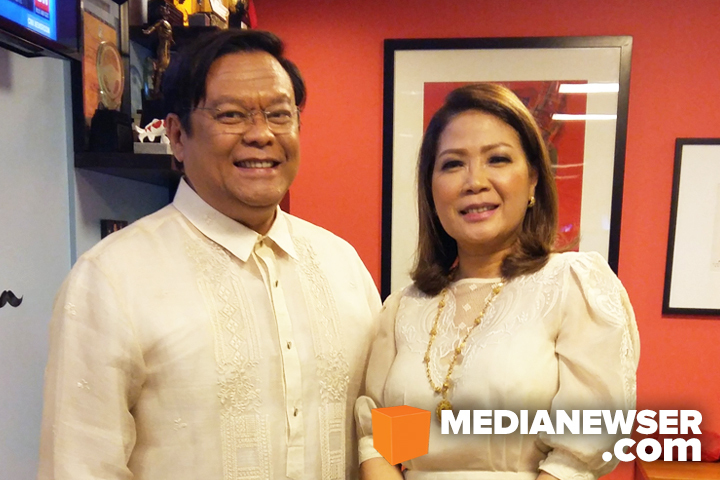 With Cherie Mercado during TV5's 2016 election day coverage. Did you plan on becoming a broadcaster? Paano kayo nasabak sa industriya? So pumunta sila Luchi Cruz-Valdes ng TV5 sa Ateneo, and they were impressed to know that aside from NAMREL mayroon pa palang mga ganito kasi LENTE’s networks are the schools – ‘yung mga Xavier University, Ateneo De Davao, at mga students. So, pinartner ng TV5 ang LENTE for the election. So, your first TV appearance was during TV5's election day coverage in 2010? Yes! TV5 then called and said, “Atty. Mel, can you be the legal resource speaker? Call time is 4AM kasi we start at 5AM. And you’ll only be up to 9:30AM.” So, nag-appear ako. Kasama ko pa sa shift na ‘yun si Cherie Mercado. And then after that I went home to catch up some sleep. Mga 12 o’clock tumawag uli ang TV5, “Atty. Mel, ang ganda ng reception. Balik ka, please.” Sabi ko ayoko na. Pero ang sabi nila, “Sige na, atty.” Ayun, andoon ako hanggang mga bandang 11PM. Ako na ang sumuko, kasi sabi ko I am not really used to this. After that, noong pauwi na ako, nagpaalam ako kina Luchi, nagpasalamat kami sa isa’t isa. And then sabi niya sa akin sa text, “Atty. Mel, you just stay put. You are a natural. I might have something for you.” That was May of 2010. With his Relasyon co-anchor, News5 Chief Luchi Cruz-Valdes. Months passed, that was in October, tumawag sa akin si Luchi, “Mel, can you come to Marajo, our business center, because I want to talk to you personally after our board meeting.” Alam mo I had an inkling na noon e, siguro show ‘yan. Paglabas ni Luchi, “Atty. Mel, may show ka. Pero sa radyo lang ha [Radyo Singko]. Mag-uumpisa tayo, kasama mo ako. Ang programa natin ay Relasyon. The next day, pumunta ako sa Novaliches studio, nag-mic test ako, tinignan nila boses ko. November 8 bali 'yung first airing namin. Kaya I was one of the original anchors there. And you seem to be enjoying Relasyon, at naka-ilang taon na rin kayo sa programa na 'yun. We didn’t expect Relasyon to be that good. Ang daming nakikinig, and daming nanonood, and daming natutulungan. Masaya, masayang gawin ang programa. "The country has a life of its own now. Ang gusto ko lang there is freedom of information and freedom of speech. Huwag lang mawala mga ‘yan." Co-anchoring the radio program for years now, how do you engage with your listeners? Sa akin, gusto ko na matuto ang tao, alam mo ‘yun? Kaya talagang tinatagalog ko sila. Petition for impugning the legitimacy of a child, paano ko tatagalugin ito? Ano po ‘yan, sasabihin ko sa audience, petition para sa ligal na pagtatakwil sa ibang bata na hindi mo pala anak. Nullity of marriage, pagpuputol po ng kasal. Presumption of death, pagpapalagay po na patay, isa hong pagtuturing na patay pero nasasapawan rin naman po ng tunay na ebidensya. Tinatagalog ko talaga. There’s so much things na ako rin natutuwa ako sa mga tagalog ko. We reported this in 2013 — that you would be named the new dean of FEU Institute of Law. Tell us about this role of yours. This Law school came in November of 2013, out of the blue rin ito. Hindi ko akalain ito. Kaya sinasabi ko sa mga estudyante ko na, alam niyo your classmates may look ordinary to you right now, but your classmates, as well as your professors, will be your best allies in the future. 2013 may tumawag sa akin, “Mel, si Mike Alba ito. Mula 1978 noong graduation hindi tayo nagkita. Mel, gusto kitang kausapin. Ako na ang president ng FEU. I want you on board. You will be screened pero ikaw ang gusto ko. I personally want you." I went in November. Nagpakilala ako class by class. Wala akong nilampasan. I didn’t meet them in mass, I met with each class to make it more personal. Then I also met the professors. Ang tanong sa akin ng FEU [management] ay, “What’s your philosophy, Atty. Mel?” Simple lang ako, movement and professors. We move from Morayta to Makati. We’re in the middle of the commercial district. There are just so many law offices here so we will have new professors. Kaya the following school year, lumipat ang first year dito. Ano na po 'yung nagbago simula noong umupo kayo bilang dean ng FEU Institute of Law? From 2013 up to last school year, we increased by 131% from 70 to 169 students. That problem is solved. I am just keeping up with the momentum. Eh, grabe ang aming social media marketing. Kasi 'yung mga students doon sa Morayta, ‘yung foundation nun, I have no part in that. Sila 'yung mga nadatnan ko. Sa Law school kasi napakaimportante ng foundation. The first political law, you must be really good. Ibig kong sabihin ay maganda na foundation mo. Kasi ang 4th year is just a matter of adjustment. 'Yung Civil Law Review for example, it’s not a case of start all over again, it’s just a case of salient points which means that you want your students na 'yung mga maliliit na subject kaya mo na ‘yan. Para at least ‘pag graduate mo may namamaster ka. Ganoon na lang ang philosophy. Regarding the professors, to their credit, they understood. Ang aking mantra kasi, I am trying to rebrand the FEU Institute of Law. Yaan ang aking mantra. I am trying to rebrand it to get its former glory. Hindi ba 'yung sa movie na Field of Dreams ni Kevin Costner sabi na, “If you build it, they will come.” ‘Yun ang naging principle ko parati. My test will come in 2018, when my students will take the bar. This one I am already intervening, ‘yung pinapasok ko na yung magagaling na professors. With President Benigno "Noynoy" Aquino at the Malacañang Palace during the taping of Interview with the President TV special. 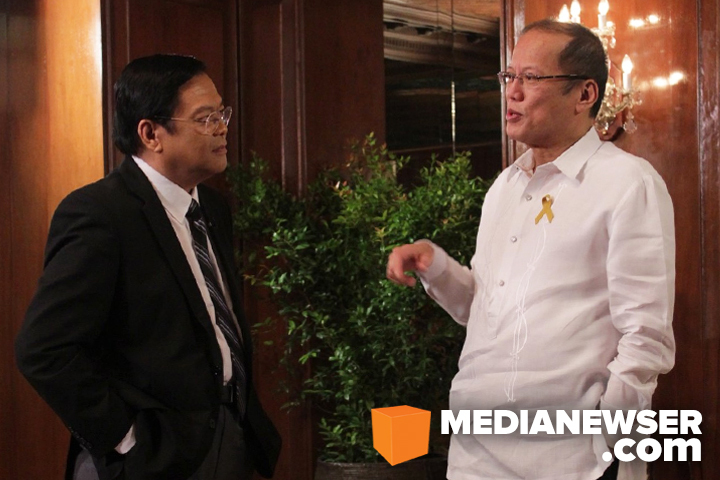 Your interview with President Aquino remains one of the most memorable television interviews of the last five years. Just to look back, how did you and your team secure this interview? 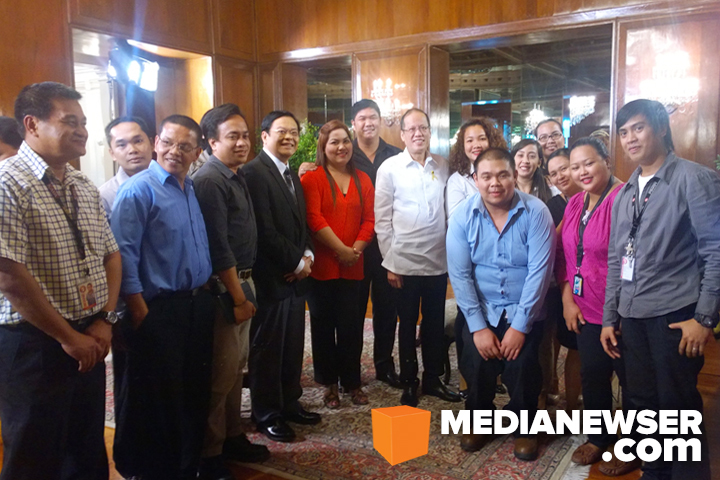 With President Aquino and the entire production team behind the Interview with the President TV special. Eh, biglaang nagpaalam. Sabi ko sa staff, "Magpapasalamat tayo diyaan." Sabi ko sa staff tawagan natin, “Sec. Butch, thank you very much ha. Ito, joke lang ito, siguro sa susunod ang presidente na ho ang aking maiinterview?” Doon nag-umpisa ‘yun. I didn’t really think too much of it. Days later, may nagtext sa akin, “You are scheduled to interview the president.” Eh nasa akin yung cellphone number ni Butch Abad so sabi ko baka serious ito. So. tinext ko, “Secretary, totoo ba ito, kasi may katatawag lang sa akin at iinterviewhin ko daw ang pangulo?” Sabi niya, totoo daw. So, that was the story. Masaya ako na I got this for TV5. In the immediate aftermath of his interview with President Aquino, the latter's statement about constitutional amendment made it to the front page of the major dailies. You’ve been part of the business for six years now. What’s the biggest thing you’ve learned from the people in this business? You know, I grew in six years because pinag-aaralan ko rin yan. And you know lawyers tend to be proud but ako I heed people’s advice. Kasi ‘yung mga nasa media, they are the experts. I am a lawyer. My wavelength, my perspectives are just different. They’ve been here and they know what will attract people. Seeing you on TV and meeting you in person, we get a sense that you are who you are on TV. How do you maintain being grounded? I always go home. I make sure that I fetch my daughter. We go home together. ‘Yung mga anak ko talaga. I feel grounded because of family. ‘Yung mga tagaTV5, they are good friends. You always go home with family. That’s my perspective eh. For my culture as a lawyer, go ahead, tell many things about me. I have received many brickbats in so many cases as a lawyer. Simple lang ‘yan. It doesn’t really matter. 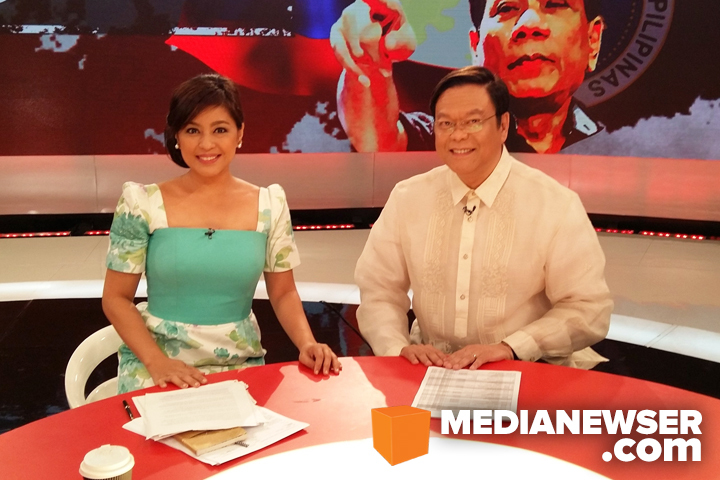 On set with his co-hosts on Solved na Solved, Arnell Ignacio and Gelli De Belen. What do you want to do next? Is there a particular format or show that you would like to do next if given a chance? Alam niyo nag-pitch ako sa TV5 ng interview show about a year ago. So, ang ginawa ko ini-slice ko ung presidential interview. Ang pinakita ko yung mga questions ko lamang. Pitch lang, you don’t expect anything. Two weeks passed, sabi ko baka rejected. Walang nangyari eh. Tapos lumapit sa akin si Luchi, sabi niya, ”Mel, may show kang bago. Pero ang partner mo si Gelli De Belen at Arnel Ignacio.” Ito yung Solved na Solved [ng Entertainment TV]. Tapos ipinatawag ako ni Wilma Galvante [former Chief Entertainment Content Officer for TV5], sabi niya, “Mel may show ako para sa iyo, Solved na Solved." I think it was Wilma who saw the potential. They are the experts, di ba? Kaya up to now nagpapasalamat ako kay Wilma. But alam niyo, my dream is to host an interview show. ‘Yung parang kay Charlie Rose sa Bloomberg. "I always go home. I make sure that I fetch my daughter. We go home together. ‘Yung mga anak ko talaga. I feel grounded because of family." In closing, what would be your advice to those who want to join the broadcasting industry? First, you have to like what do. Second, as a broadcaster, and this is a valuable lesson, you have to be there all the time especially in radio. For four years I was never absent. That’s why ang sabi sa akin ni Luchi, “Mel, mag-absent ka naman." Never ako umabsent. Every day nandiyan ako sa Relasyon, walang patid. And kung may gustong magpapinch-hit, I pinch-hit. Walang hesitations ‘yan. And if you do it, yung passion mo, then aside from being present to people, ‘yung possibility na marinig ka when they turn on the radio, hino-hone mo rin ‘yung sarili mo. You have to be there all the time when you talk about broadcasting in radio. Hindi pwedeng seasonal lang, you have to be there. That’s the valuable lesson I learned. Sa TV naman, noon kasi I was very stiff. Sasabihin ni Direk sa akin, “Atty. Mel, kapag nakatingin kayo sa camera, you flirt with the camera." So, I got used to it. Kung hindi ka open matuto, maiiwan ka. You just have to listen to other people, sila ‘yung expert sa TV. I am an expert sa Law, but they are ones who are the experts on TV, sila ‘yun. Hanggang ngayon kapag pinapaalalahanan ako, open ako. So they respect me, and I know that they know I respect them, too. And you practice yourself. You listen to yourself. Ako, sometimes I look at the TV. Kaya I know my best profile. You have to do that. Sa opinion writing, just say what you want to say, do not be so much affected by the comments of others. As a matter of fact, ‘yung comment or opinion nila, they can be a topic of some other subjects.